Due to the tropical heat in Saigon, it seems as though life actually happens during the edges of the day. And by life, I mean food. The best (i.e. freshest and most varied) stuff is sold either early in the morning or after the sun sets. Lunchtime equals nap time in these here parts. Now that I’ve properly quit my day job, I’ve started to venture out at night to try the evening offerings. One of my favorites thus far has been bánh cuốn. Making bánh cuốn requires a delicate touch. 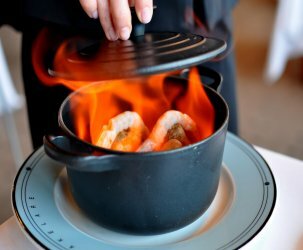 A rice flour batter is spread thinly over a hotplate to cook for a few scorching seconds. Removing the ever-so-thin crepe from the steaming plate takes precision and patience. 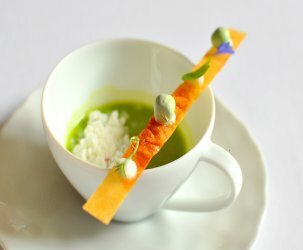 If the process is rushed, one ends up with a ball of rice flour rather than a dainty crepe. Next, the crepe is stuffed with a prefabbed mixture of ground pork and woodear mushrooms seasoned with ground black pepper and fish sauce. The crepe is then folded up like an egg roll. The six rolls of bánh cuốn on my plate were topped with blanched bean sprouts, basil, fried shallots, cha (pork forcemeat), nem chua (fermented pork forcemeat), banh dau (deep-fried mung bean cake), and a healthy dousing of nuoc cham. The bánh cuốn were so fresh that the heat from the griddle were still with them. Ahh… The crepe was light and held the meaty contents well. The nem chua was decent as far as sour salami goes, but I much preferred the plain ‘ol cha. The banh dau was a spongy doughnut that soaked up the nuoc cham nicely. Wow, I’m so jealous (again)! Fresh banh cuon is one of my favorite meals, although I never found it in the evenings, we always had to get up early to get it for breakfast. 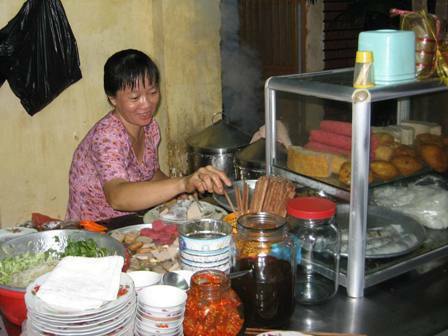 Yen – Perhaps banh cuon at night is a District 4 phenomenon? At home we always eat it for breakfast, so it makes sense that it would only be available in the mornings. 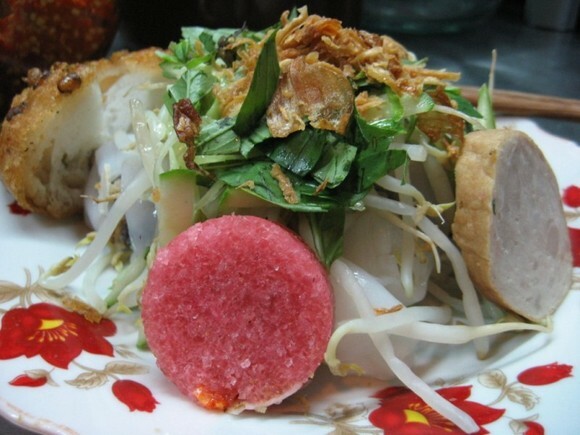 Angel – I’ve never had nem chua with banh cuon until recently. Cha is definitely best! Hello Wandering – Editing and writing is more than enough to pay the bills (student loans too!). Will gladly pass the torch to you in July if you move here. I have joined the Lainey Lurv group! I find the blind items impossible to solve, so the group will be helpful indeed. Do you love Lainey as much as I do? 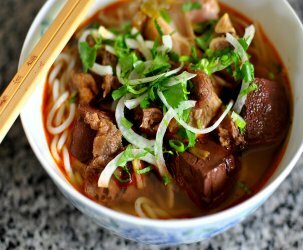 Have you tried Bánh Cuốn Tây Hồ on Đinh Tiên Hoàng Street? If so, how does this place compare to it? Thanks. Interesting..this is like a banh cuon (pork and mushroom stuffing) banh uot (cha lua, nuoc cham, banh dau xanh) hybrid. The best of both worlds!! They actually serve a great banh uot at the same place you ate banh xeo at on cach mang thang tam street. from concentrate one. Thanks a lot. Reminds me of my mother-in-law. She made me bánh cuốn while I was dating her daughter in college. I tell my wife (now) it was one of the reasons I married her – and not really joking! It is very time consuming to make. Bà nội didn’t serve it with deep-fried mung bean cake, but that is an awesome topping at the restaurants! The typical sausage is ‘chả lụa’. Very similar to the Bánh Cuốn shop near my wife’s aunties house in Tan Binh district HCMC, its one of my faves.